A 54-year-old African-American woman presents to her primary care physician's office with a history of right-sided chest discomfort and intermittent dry cough of 4 weeks' duration. She denies having a fever, chest pressure, night sweats, hemoptysis, or weight loss. However, she does admit to a 25–pack-year history of smoking and denies using any illicit drugs. She has not recently traveled outside the United States. On physical examination, she is afebrile with a normal heart rate and blood pressure. She is a well-developed, thin woman who appears to be in no apparent distress. Findings from the patient's lung and heart examination are unremarkable. Findings from the remainder of the examination are also unremarkable. 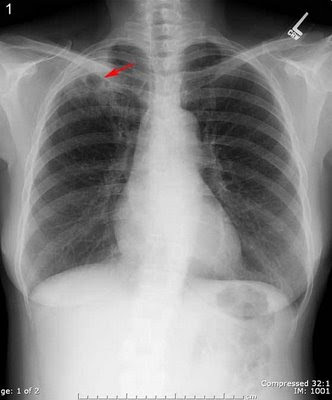 The chest radiograph (see Image 1) demonstrates a cavitary mass in the right upper lobe of the lung. Follow-up chest CT (see Image 2) shows the same cavitary mass as a thick-walled lesion in the posterior segment of the right upper lobe. It measures 4.2 X 5.5 cm.The patient is initially given a 2-week course of oral clindamycin. However, follow-up chest images obtained approximately 1 month afterward fail to reveal any interval improvement. 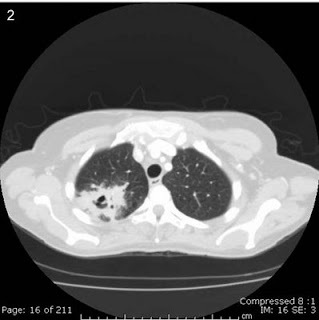 A positron emission tomographic (PET) scan is subsequently obtained and shows abnormal [18F]-fluorodeoxyglucose (FDG) uptake in the right posterior and apical segments of the right upper lobe and right hilar lymph node with no other foci of abnormal uptake. Ultrasonography-guided aspiration and core lung-mass biopsy are performed, but the results are nondiagnostic.The patient eventually undergoes thoracotomy and right upper lobectomy. Biopsy specimens are obtained. The pathology specimen shows evidence of acute necrotizing bronchopneumonia and a cavitary abscess. Silver staining demonstrates aggregates of filamentous organisms (see Image 3). What is the organism, and what is the diagnosis? 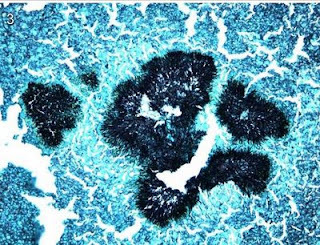 Hint: Silver staining of the pathology specimen best demonstrates this organism.